I think there is more to a limited palette than just simplicity. This painting has just 4 colours (Burnt Sienna, Yellow Ochre, Cobalt Blue, Raw Umber) and there is a clarity and cleanness which I have found, in other paintings, is reduced with the addition of more colours. This may be OK for some subjects, dull stormy days, sunsets, but for brilliantly bright days to look brilliantly bright, the paint mixes must be clean with high chroma. 3 of the 4 colours above are ‘earth’ colours and I find they mix well together. By this I mean the resultant combinations are as rich as the colour directly from the tube. The funny thing is that the tube colours themselves are pretty dull to start with but the mixes don’t get any duller. This reduced palette is often referred to as a ‘beginners palette’. Beginners tend to prefer a wider range of colours to reduce the mixing required to match a particular colour. This is where the dullness makes an entry. Maybe this is why its a safer option to have less colours to reduce the chances of dull colours. There is a contradiction here. It takes a bit of effort and experience to get the best out of a limited range of colours. The way a limited range works for me is to pick a small number of particular colours for a particular scene. The amount of mixing is reduced and the resultant colours are rich. Another bit of advice to a beginner is not get involved in ‘fiddly details’. I think this has more to do with getting involved in detail too early on in the painting process. Sometimes ‘fiddly details’ are an important part of a painting. This painting is one such example. The foreground details are intense to help to create distance because there is a lack of ‘lines of perspective’ in the painting. The painting of details with a fine brush can be tedious and I will often place a reservoir of colour and use a fine brush to drag fine lines outward. For example a heavy branch of a tree can have a blob of colour placed on top and the fine branches drawn out of this blob. Multiple fine branches can be drawn quickly without returning to the palette to replenish the brush. In this painting the reservoir was outside the frame of the painting, on the masking tape. The fine lines were drawn from the blobs of paint quickly without the need to pick up fresh paint. The ease of painting allows you to concentrate on the structures. The following video shows this process and although the video is speeded-up it was a fast procedure and a lot of ‘fiddly details’ were achieved in a short time. 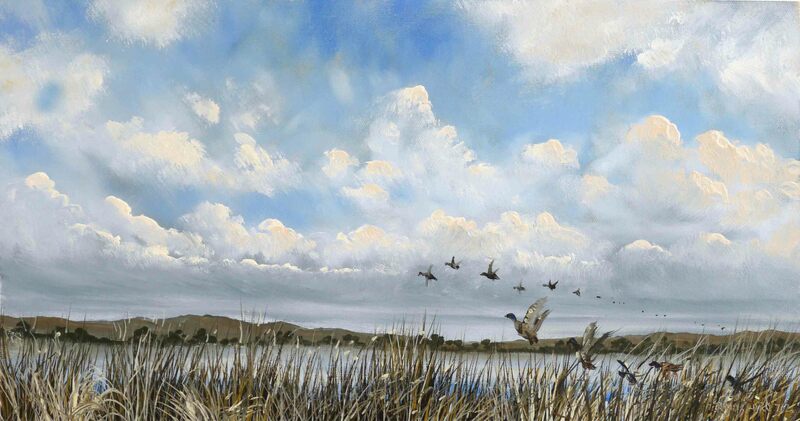 This entry was posted in Oil Painting and tagged Art, Clouds, Culture, Ducks, Education, Inspiration, Irish landscape, Oil Painting, Oil Painting Instruction, Oil Painting Landscape, painting, Pictures, Sky, Time lapse painting, Wildlife. Bookmark the permalink. I also love watching other artists work, especially time lapse videos. You can learn so much is such a short time. Your videos are a really generous gift to us! thank you Liam. And what you achieve with such a limited palette is a spur to action! I’m delighted you find the videos useful. I enjoy the sharing that the videos allow and love knowing that they are appreciated and helpful. Wildlife subjects are a little outside my comfort zone, but it make me appreciate the work of the wildlife artists out there. Thank you Geralin. This music is a piece of traditional Irish music played on the Uileann Pipes, an ancient instrument similar to the Scottish bagpipes but with a less aggressive sound. These pipes were developed from a bagpipe type instrument at the beginning of the 18th century. The air is fed from a bellows operated by the arm as opposed to blown by the mouth. It’s such a fascinating instrument.